Detail the import methodology in Pakistan. How to import to Pakistan? What are the import procedures in Pakistan to move goods? Explain about import registration process, cargo movement to Pakistan from overseas countries, Import delivery process in Pakistan etc. 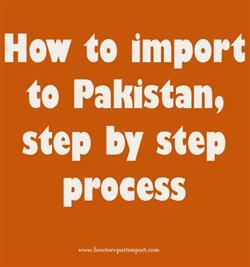 This post explains about step by step procedures that need to be finished with Pakistan government authority for importation to Pakistan. You have to register your company for exporting and importing anything for commercial purpose from and into Pakistan. Subsequently get the National Tax Number and Sales Tax Number for your company. Enlistment in both Chamber of Commerce and Industries or any relevant trade association and with the Export Promotion Bureau is also required. The efficiency of the Customs Clearance process is depend on having the valid documents, the accuracy of the information provided in the documents as well as the promptness in submitting the documents and filing the necessary applications for the Customs Clearance. Any delay in filing or absence of documents can delay the clearance process and thereby importer supposed incur demurrage on the imported cargo but also stand to loose business opportunities. Understanding the right export documents is essential for smooth import and export procedures. This post explains about different phases in import process that every importer needs to go through in Pakistan. Ghulam Bangash: On 29 January 2019 I want to know about the whole process of import and export.i have the certificate and i know about that.